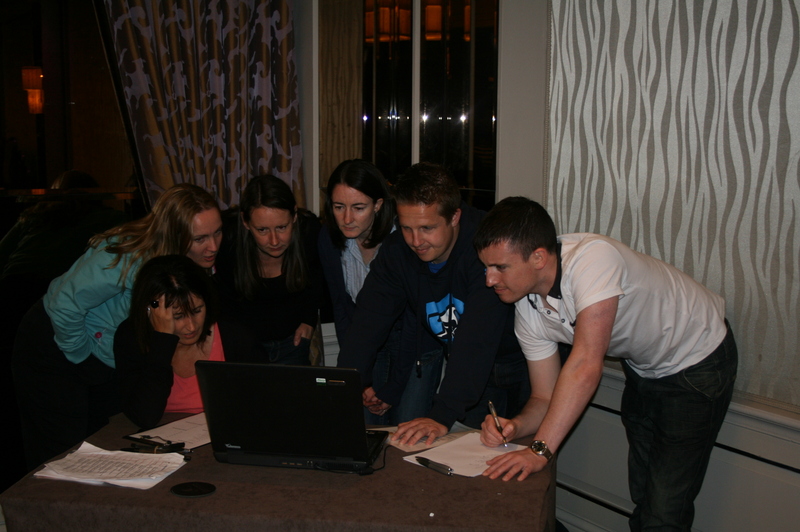 However you use these fun team activities you will find that they can have a real impact on your event. 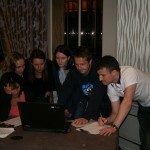 We have used them on all our team building events for over 20 years. In tough times they are also extrememly economical; you can run these team activites yourself without having to employ expensive outsiders! 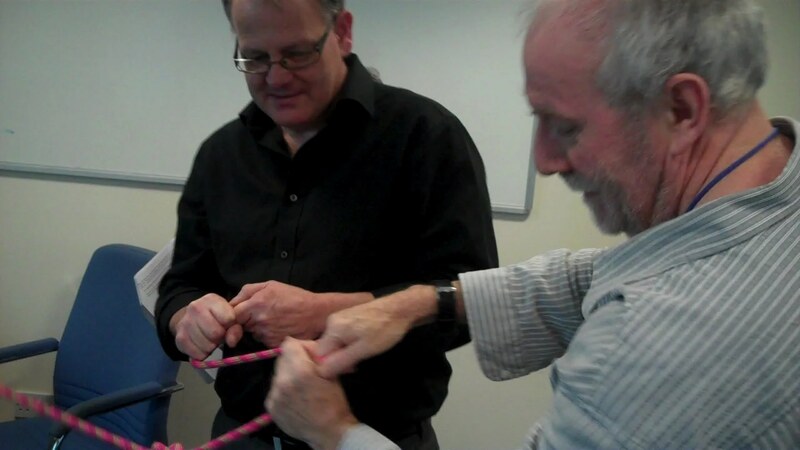 Check out the ice breaker ideas web-site for more on the sticky rope team activity and for ice breaker and training ideas to sky rocket your events! ﻿If you're looking for a fun way to demonstrate communication skills here's a neat little communications exercise that will throw up lots for discussion on the accuracy of communication. You will need a group size of at least 2 teams; a small lego model and an extra set of lego materials per team. Split the group into teams of 4-6 people and give each team a set of lego materials. Place the lego model away from the team’s view but make sure it is of equal distance from each team. Ask one member from each team to come forward to view the model for 20 seconds. Send this person back to their team, when they should then instruct the rest of the team on how to build the model. They are not allowed to touch the model themselves. After one minute ring a bell or ask the teams to send another person to view for 5 seconds. This continues until the first team declare that they have the perfectly replicated model. The model is checked and if they are correct, they win, if not the exercise continues. The exercise can continue until all teams have finished. How accurate were the instructions? How hard is it to re-create something without being able to see? How difficult is it to view but not build? If you enjoyed this communication ice breaker you will find many more fantastic games and icebreakers to enhance your training programs and events on the ice breaker ideas web-site. Sharon Naylor is passionate about ice breaker games and team building activities to get people joining in and having fun. "When people are switched on and engaged they are more disposed to learning and taking in the main messages of the day." Games and icebreakers are suitable for any type of group and activity whether it be for young people or adults; work training or functions or social events, meetings and clubs. Here's a fantastic fun ice breaker or energizer to help participants get involved in a session straight away. It's high energy and a version of the old "Bingo" favourite. So, get a sheet of paper and design like a bingo card with a number of boxes. 8 or 10 is a good number depending upon numbers in your group. Think of some wacky tasks that you can ask individuals to perform and write down each task in a box. Copy the sheet and give a sheet to each participant. 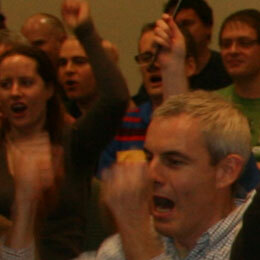 When you say GO, ask them to mingle with the crowd and try and find a person to perform each of the individual tasks. When one person has performed a task you ask them to sign the box on the sheet and then go and look for another person to perform the next task. The first person to have a signature in each box shouts "finished" and is the winner. The effect will be a raucous and lively energizer. Completely uplifting! Your group will love it! ﻿Sharon Naylor is passionate about ice breaker games for work, play, parties, meetings, groups and clubs. In fact anywhere people are connecting to others whether it be for the first time or even when familiar with each other. Ice breaker games and energisers inject a sense of fun into gatherings, speed up that getting to know you stage and get people ready to face the rest of the event with high energy and expectation. For more brilliant ice breaker ideas that you can use with your own groups and teams visit the ice breaker ideas web-site. Here's a great introductory ice breaker for a team or group meeting for the first time. All you need is a large ball of string or wool. Introduce the exercise "We're all meeting for the first time. Most of us don't know each other at all. It's easier to get to know each other and make connections with people when you find something in common. This is the main purpose of an ice breaker game. In some cases you might have a lot in common with an individual but often you have to discover what it is first. This game will give you a helping hand"
Ask everyone to sit or stand in a circle. Starting with yourself, say "My name is Sharon" and start to talk about yourself. "I have 3 sisters. I live in Wales. I walk to work. I work at...etc. etc." By this time hopefully you might find someone else in the group with 3 sisters or even a sister and they then shout "CONNECT!" when they have found something to connect with you. Holding onto the tail-end of the ball of string you throw the ball to them. They then introduce themselves and continue saying something about themselves until someone else connects with them. They then hold onto the string and throw the ball to that person. And on it goes. Ensure everyone has a go at connecting with someone else in the group; you might want to add this as a rule until everyone has had a go. Continue connecting until you have had enough. You will surely now be in a mess with strands of wool or string going all over the circle. End the ice breaker game by explaining that we all have things in common with other people, but they are often hidden. Look at all the ways we are interconnected with each other... look at all the strands of string. Building relationships and rapport can be speeded up by finding and sharing similarities. Sharon Naylor is passionate about ice breaker games for work, play, parties, meetings, groups and clubs. In fact anywhere people are connecting to others whether it be for the first time or even when familiar with each other. Ice breaker games inject a sense of fun into proceedings, speed up that getting to know you stage and gets people ready to face the rest of the event with energy and enthusiasm. For more brilliant ice breaker ideas that you can use with your own groups and teams visit the ice breaker ideas web-site. 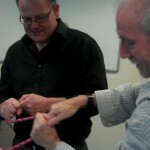 Ice breaker games are powerful allies for getting groups and teams to gel and work together quickly. Many trainers, group leaders, teachers, charity workers, committee leaders, church, youth and team leaders to professional consultants and managers employ ice breakers to break down barriers and accelerate the getting to know you phase of learning and engagement. 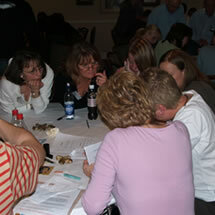 This ice breaker game is ideal for newish teams and ideal group size is 7 -15. So, give each person an envelope and enough strips of paper for every person in the group. So, if there are 12 people in the group give each person an envelope and 12 strips of paper. Get everyone to write their name on the envelop and then pass the envelope to the person on their left. Instruct every receiver of the envelope to write a positive first impression about the person with their name on the envelope they hold. Then place the strip of paper in the enveope and pass to the left again. Repeat the process for every person in the group. Eventually the envelope will return to the owner and will contain 12 strips of paper, each with a positive first impression. Ask each person in turn to dip into their envelope and read aloud a positive attribute. How powerful is this! Each person will have an envelope full of positive messages and will feel warm towards the group, even though they barely know each other. This is a fantastic platform to build on! Here's a great game I recently came across though it is more for an established group than a new group. Split your group into teams - you will need at least 2 teams. Allocate every team to another team and than ask each team to write a story about the other team using their talents and positive attributes. First, get teams to make a list of the team members they are portraying as characters for their story. Make sure teams can't hear each other during the writing. Allow about 20 minutes to write the story. When everyone is ready get each team in turn to read out the story. Ask groups for feedback and question what it was like to hear themselves being described as part of a story. Were people surprised at their chosen attributes and talents ? Do they see themselves as others do? 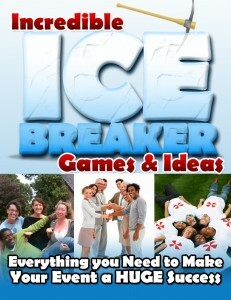 Check-out the Incredible Ice Breaker Games and Ideas web-site for more group games and ice breaker ideas.